Being out at the lake is another popular community outing. Heather is walking on the pier in her Pacer. Going over uneven planks of wood is a challenge but Heather is determined to reach the end of the pier. Who would not enjoy looking out over the lake? Although the ladies may need assistance to walk to the bench they are able to sit independently on a typical park bench and “hang out” while enjoying a gentle breeze on a beautiful day. At Chesapeake Care Resources the individuals are out in the community all the time. Some of their favorite activities are going shopping for themselves. Joseph is purchasing an item at the store. Joseph uses the TRAM to allow him independent mobility. He has practiced the skill of using money at the day program before going out into the community. High Point School became the 31st site to be dedicated as a MOVE Model Site on Nov. 14, 2018. It is not easy to become a MOVE Model Site as the expectations are quite high. As MOVE Intl. has “high expectations” for sites to become a MOVE Model Site, High Point has “high expectations” for their students. When you enter the school you will see students practicing their gross motor skills of sitting, standing, walking and transitioning throughout the day and in all school environments. Motor skills are taught throughout the routine day and the student’s days are filled with fun learning activities. Upright toileting has been very successful and several students now void on the toilet. Emma and her mom participated in the dedication ceremony and enjoyed the dance afterwards with all the glitter and glamour of a typical school dance. A local DJ donated his time and provided some great dance music. Students were rocking it in their Pacers, walkers, etc. along with parents and staff. Our students, including Madison, have now transitioned from their wheelchairs to gait trainers and typical student desks/chairs during meals and circle time. Madison used to slump in her gait trainer and/or wheelchair. She needed constant verbal prompts to “sit up” like a big girl. The MOVE Team decided to use a typical student desk/chair and step stool (for foot support) during circle time activities. Much to our surprise, Madison asked to stay in the desk ALL DAY LONG! Her posture has improved significantly. She sits up straight, like her typical peers, requiring very few verbal prompts. Madison now sits in a regular desk/chair for all her activities, including lunch. Her wheelchair is used only for transport. Madison is just one example of how MOVE is impacting our students. On Dec. 9, 2018 Charlotte, NC was under a winter storm warning. On Dec. 10-11, 2018 all twenty participants braved the weather to attend a MOVE Basic Provider training. These individuals showed true dedication to the students they service by making it to the training. Great group of professionals. Johnny began preschool at Cloverpatch Preschool at Prospect Center September of 2017. At just three and a half years old this was a huge step for both Johnny and his parents. With his Aunt Dianne as his 1:1 aid, Johnny acclimated quickly to his full day integrated program. Through the MOVE program, Johnny was encouraged to access his environment out of his wheelchair throughout his school day. 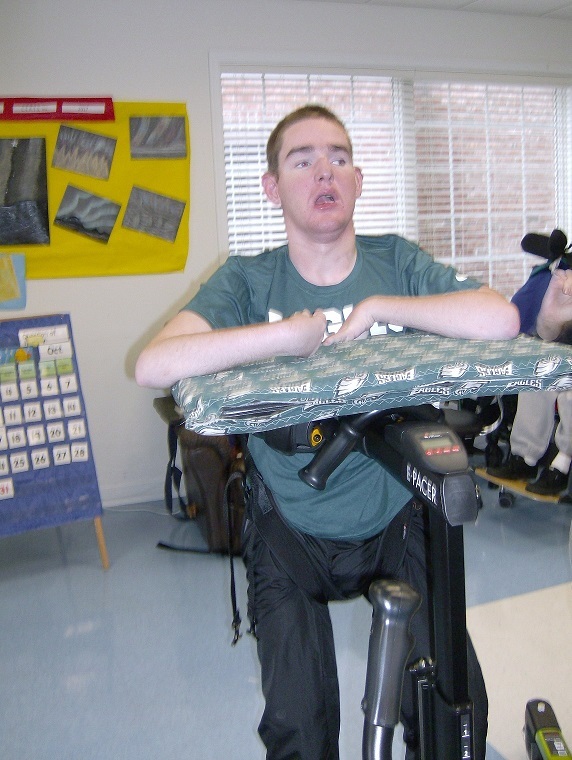 Without missing a beat, his aunt established a routine using equipment (Rifton Pacer gait trainer, Rifton Dynamic Stander, Rifton Activity Chair) and outside support to allow Johnny to functionally participate in his school day. After arriving to school in his wheelchair, while still in the hallway, he was transitioned into his gait trainer. He was encouraged to walk into the classroom and sign in and interact with peers as they arrived to school. After being in his gait trainer for approximately 20 minutes, Johnny would require toileting. Following toileting, Johnny was positioned in his activity chair for dining. And so his mornings went for a couple of months. Recognizing that Johnny was very regular with his toileting needs, his team decided to trial him on the Rifton Hygiene and Toileting System (HTS). Johnny had shown great progress in his ability to tolerate an upright, supported sitting position in the Rifton Activity Chair, leading the team to believe that positioning in the HTS would be similar. Johnny was fitted and trialed in the HTS fully clothed and was found to tolerate positioning as suspected. Additionally, Johnny’s ability to utilize an eye gaze device to communicate would allow him to indicate his need to utilize the bathroom. The plan was to tweak his routine a little to hopefully catch him before he relieved himself, position him on the HTS and encourage urination and bowel movements while positioned. With a plan in place, just a few weeks after his fourth birthday, Johnny began his toilet training journey. The first day the plan was implemented in February of 2018, Johnny’s day started like any other, however, following-sign in he was positioned on the HTS...and then his world changed. Johnny was successful in both urination and BM on the HTS!! From day one Johnny never looked back. With consistent, scheduled toileting, he was continent of both bowel and bladder throughout his school day! At Prospect this is built into the daily classroom routine and Johnny was able to become toilet trained. The use of the Activity Chair in the months prior to his toilet training was key in building his tolerance to upright positioning. Recognizing the pattern in his bowel and bladder habits, as well as his ability to communicate, were also important clues that toilet training may be successful for Johnny. However, most importantly was that he was given the opportunity to rise to the challenge and show what he was capable of. Johnny continues to utilize the HTS at school and due to his success, he was able to receive an HTS for use at home. Olivia started at the RISE Learning Center in 2016-2017 school year. She came to school after having hip dysplasia and corrective surgery. Olivia wasn’t able to fully extend her legs and preferred the fetal position for comfort. Olivia often expressed her discomfort in other positions by crying. Olivia started using the Rifton Support Station and Rifton Pacer to allow her legs the opportunity to extend. Olivia has been tolerating her adapted mobility equipment without crying and smiles when given the opportunity to be at eye level with her peers. Olivia likes music and hanging with her peers. 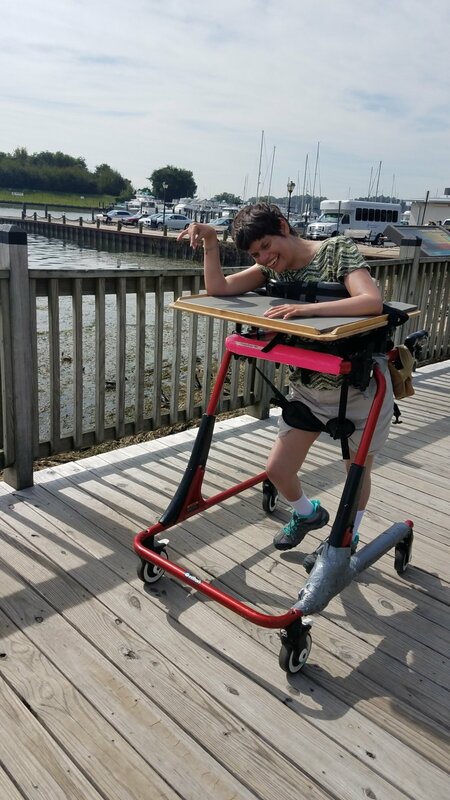 As the extension of her hips and knees has increased, Olivia is now able to tolerate standing in a Rifton Dynamic Stander for up to an hour! Olivia is starting to push through her legs to come to standing position during transitions as well! Olivia now participates in our school’s spirit club and encourages our basketball team during their games. Olivia now utilizes her adapted mobility equipment both at school and at home. Olivia and her parents have a renewed hope thanks to the help of the M.O.V.E. program! Rebeca is a young lady who has been involved in the M.O.V.E. program for a few years. Over the past 2 years, Rebeca has blossomed in her interactions with her environment and others. When Rebeca first came to school, she crawled as her main form of transportation throughout her environment. She is now sitting independently in a classroom chair and walking throughout her school environment with support at her forearms in her Pacer or with one hand held. Since Rebeca has been up and moving, she is starting to engage with things around her. She is starting to taste new foods, communicate with her peers, and tolerating daily living activities. Rebeca did not want to engage with others when starting school and now she is seeking out interactions with not only staff but her peers. Rebeca did not like to be touched when starting school and now she smiles and laughs and is starting to seek out touch from others. Rebeca is also enjoying her time in the therapy pool. This used to be one of her least favorite activities but now her smiles say otherwise. Rebeca has learned to “move” where she wants to go in her environment instead of waiting for an adult when in her Pacer. Rebeca is making choices of things she wants and making eye contact with objects and people in which she is engaging. Rebeca hasn’t had the opportunity to experience much of her community since crawling was her only way to get around. Now with walking with one hand held or using her Pacer, Rebeca is enjoying community trips and riding the bus in a regular bus seat. With the opportunity to “move”, Rebeca’s personality now shines bright. In August 2017, C.E.R.T.S. Adult Day Program hosted Rifton at our Model Site in Newark, Delaware for the demonstration of their New E-Pacer. Since that time, Home MediService Inc. was very generous in lending us an E-Pacer for several weeks to use. We had the opportunity to trial several of our participants at both our Newark and Smyrna sites. Demi from the C.E.R.T.S. Newark site trialed the E-Pacer, she appears standing more upright and in a better position for taking steps. Our staff commented on the ease and safety of getting Demi in and out of the E-Pacer. Although the MOVE Program was started for children, it has proved highly successful with any age individual with multiple disabilities. MOVE for Adults started with a pilot study at Chesapeake Care Inc. in Maryland back in 2004. MOVE is all one program from toddlers to geriatrics. There are adult day programs across the US that have incorporated the MOVE Program. Deanna Bandy is a very social and fun loving lady. She is a talented artist and enjoys drawing. This picture is from a whale watching trip. There was a pod of whales swimming along side the boat. Deanna loves animals and also likes listening to music. Quite often you will find her singing along to the radio. When Deanna began attending Smith Center Adult Day Program she joined the MOVE program. In the beginning, she was a bit scared and resistant about using the Rifton Equipment. The staff, along with the physical therapist, worked with Deanna daily to form a trusting relationship. Deanna remained a bit apprehensive but eventually she was willing to try to use the equipment, once she understood all the benefits that came along with being involved in the MOVE Program. In preparation for this staff started with just asking Deanna to help in her personal care needs. The physical therapist started working with Deanna on sitting upright on the edge of a mat table. Staff began to incorporate this into her daily routine. As Deanna's ability to sit upright increased staff provided less and less support. Deanna is now able to sit upright unsupported for short periods of time and she is also able to sit in a Rifton Activity Chair with minimal prompts. Deanna has created many of her beautiful drawings while sitting in the Rifton Activity Chair with the tray attached. She also enjoys working on activities and having her lunch while sitting in the Activity Chair. Deanna's picture of her whale watching adventure. Soon Deanna was using the Rifton TRAM to help elongate and stretch her body and hips. This was performed by assisting Deanna into the Rifton Tram with the saddle prompt as a sling, under the guidance of the physical therapist initially. Deanna's face lit up as soon as she was raised to an upright position. She was so happy to be at eye level with the staff and some of her peers. This was a brand new experience for Deanna. Soon she was able to spend longer periods of time in the TRAM as her body adjusted to it. She loves strolling throughout the building and visiting with her peers and staff while she's in the TRAM. Spending time in the TRAM has become something that Deanna truly looks forwards to every day. Deanna has greatly benefited on many levels from being involved in our MOVE program. Individuals at C.E.R.T.S. in Delaware are able to trial the new Rifton E-Pacer. Christina from the C.E.R.T.S. Newark site trialed the E-Pacer, she appears standing more upright and in a better position for taking steps. Our staff commented on the ease and safety of getting Demi in and out of the E-Pacer.